I remember long time ago, I faced the same error and I tried fixing it by manually adding .jar files to my maven repository locally. I executed below command to install it in my localhost maven repo and everything worked. But I didn’t try to fix this permanently. Recently I changed my laptop and again I started seeing the issue as seen below as all my manually inserted jar files were gone. 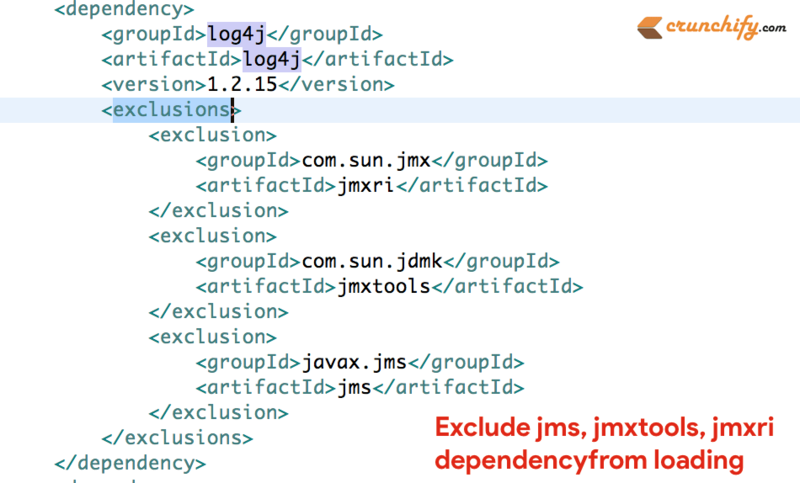 After digging further I found that, in my Java Project I was using 1.2.15 log4j dependencies. By default log4j 1.2.15 version adds all above 3 dependencies. Same for zookeeper 3.3.2 version. How to fix this this permanently? Just upgrade log4j and zookeeper to latest version. log4j 1.2.16 and zookeeper 3.4.9 doesn’t have these dependencies. Add below exclusions code to your project’s pom.xml file.